It’s Edgar’s birthday but he’s not happy. You see, he wanted a puppy but instead he got Jarvis. Jarvis the Octopus. Jarvis is a drag. He can’t do anything a dog can do. He is, however, quite clever. Maybe Edgar can train him to be like a dog. He sets to work, but Jarvis just seems to take things too far. Instead of playing dead, he dresses as a mummy. Instead of lying down, he puts himself to bed, complete with bed socks and hot water bottle. And at local dog show, he goes completely berserk, driving Edgar crazy! 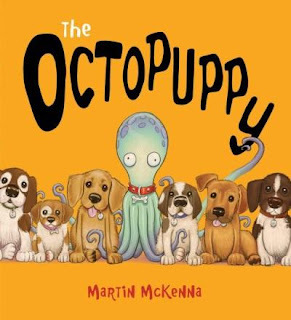 Will Octopuppy ever be the pet Edgar wants and needs? Truly sensational illustrations round out a fun romp of a story, with loads of quirk and smile-inducing faux schmaltz. I just love the scene where Edgar is on the beach, silhouetted by the setting sun, desperate to find Jarvis, and the scenes were Jarvis is trying to be what he's not. So thrilled when he learns he needs to be no one else but Jarvis.